In past few years, demand of text to speech software has increased dramatically. Because users find it easy to listen than read boring text. With the heavy demand in text to speech software number of such software’s available in the market has also increased so if you are also looking for a text to speech software and find it difficult to choose one for you then this list of 10 best Text to speech software is going to help you to choose Best Text to Speech Software for windows pc. First pick in our list is Natural reader. The application is full of amazing features such as it can read multiple number of text formats and even the web pages. All you need to do is to copy and paste the web page URL and leave the rest on the application. Another feature which makes it the best text to speech software is the capability to read scan pages and the text on images. You can also download additional languages and voices. For those who read a lot over computers. This app is having ability to read lots of text formats. You can also convert your text files to audio files which makes it simpler for you to go through the documents on the go. It can not only read text for you but it can also extract text from audio files. You can get most of the popular languages in this app. Which makes it a good Text To Speech Software for pc. If you are looking for an application with simple and easy to understand UI then it will fit your requirement very well. Though the application is having limited number of options in compare to the previously listed software in this list but still it solves the purpose of text to speech software. It can read text from outlook and website and of course from the text files. You can control voice pitch and speed of the speech. Another Best Text to Speech Software for windows 10, 7,8 is SwiftTalker. It looks like a basic text editor it can be used to read out the text either freshly created text documents, or already existing ones. The application can read the selected blocks of text, or entire document, and comes with some basic options like play/pause. You can also apply some cool and funky sound effects to the voices. Apart from this, the text can be saved as audio in which you can also customize output settings such as bit-rate. If you need a completely free text to speech software then you should choose Zabaware. Key feature of this reader is that it can automatically read standard window dialogs such as alerting, pop-up boxes you when they need attention this is why it can also be considered as personal assistant too. Format support is limited but supports required basic formats. The app integrates very well with M.S word. Like other applications it is having customizable voices. The application read aloud individual words paragraphs and you will also have an option to save narrations. There are number of keyboards shortcuts which can help you to quickly access frequently accessed options and menu. the application is free to download you can get it from the link. eSpeak has limited file format support from which it can read aloud text, being limited to just TXT and XML. It comes with only a few selectable voice choices, and you can tweak with the pitch and volume. It includes all the basic voice control/reading options, such as play/pause, skip, and reset. It is a light weight app which supports multiple languages as well. You will be surprised to know that application only take approx. 1 Mb space on your hard disc. Which makes it the Best Text To Speech Software for windows 10, 7,8.
yRead TTS Reader is another program that will read text out loud for you. It has many high-quality voices. The free version itself includes many high quality computerized voices to reads text files aloud, standard Windows dialogs, as well as instant messages and text from the clipboard. The program to read text from webpages and emails. The software can also convert a document into a WAV audio file, which can be further converted to MP3 or can be burnt to CD. ReadClip is a TTS reader can read and spell check any text document, and allows you to manage several picture clips and text on the clipboard, and generate MP3 files. Some features of this software are free and unlimited. But there are some feature which expires after the tryout period. If you want to use them you need to purchase the full version. You can make the program to read out the text from the clip board or you can also copy and paste the text into the program window. The basic version is enough to read out documents loud which supports Many of the known formats such as. Doc .rtf HTML Files and much more. You will not require to install an additional program to convert your text files to WAV and MP3 this software can do this for you. It also supports variety of languages and voices which is an addon. 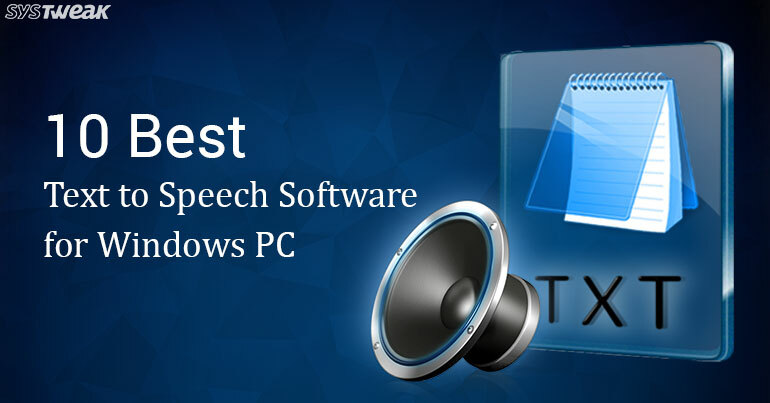 So, these were Best Text To Speech Software for Windows PC you can choose any one of them as per your choice for some of the above listed software first you can try free versions and then if you find it suitable you can purchase the full version.